Oh, and by the way, I have used exactly the same tools as in the last post minus the tracing paper. You don't need that. Step 1. 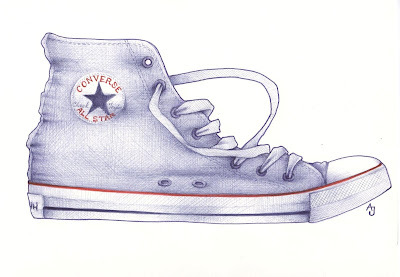 Get your Converse boot, or whatever it is you want to draw, and draw around it. Yes, actually put it on the page and draw around it. 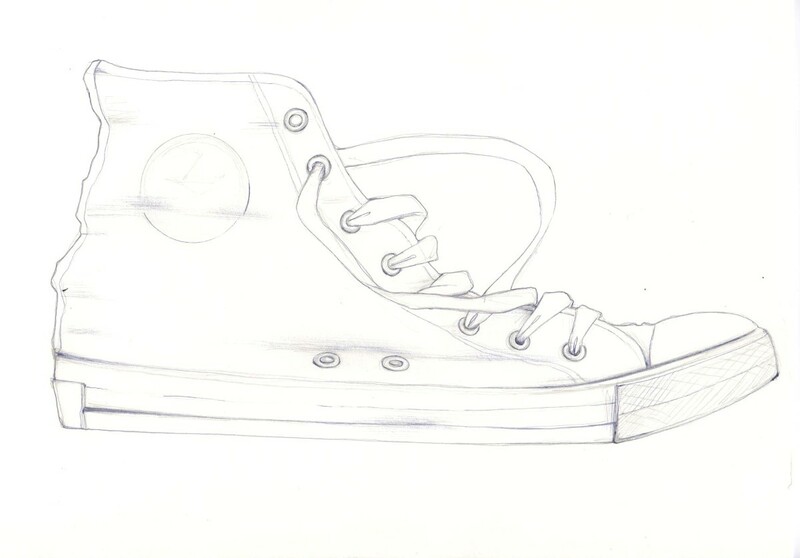 I've used pencil to get the initial shape in the drawing above. It'll never be true to shape, because it depends what angle you are coming from (in so many ways), but I like that. Step 2. Then draw around the pencil outline with a ballpoint to give you a ballpoint outline (apologies for the totally bloody obviousness of what I'm saying). It doesn't matter if it differs from the pencil outline, it's your shoe and your drawing. Step 3. Adding 'values'. I'd never actually heard this term before I started drawing-blogging. I think it might be a US term (?) or even a technical term. As I said in the last post, I've had no training so maybe that's why I'd never heard it before. So, for those, not in the know, like me, add some shading. By looking at your shoe you can see where the darker bits are - hatch there. Step 4. More hatching. More more more. Continuing on from the last step, building it up and adding some texture. Step 5. Adding more detail and continuing with the therapeutic cross hatching. Really feel those textures. Touch your boots! Step 6. Finishing touches. 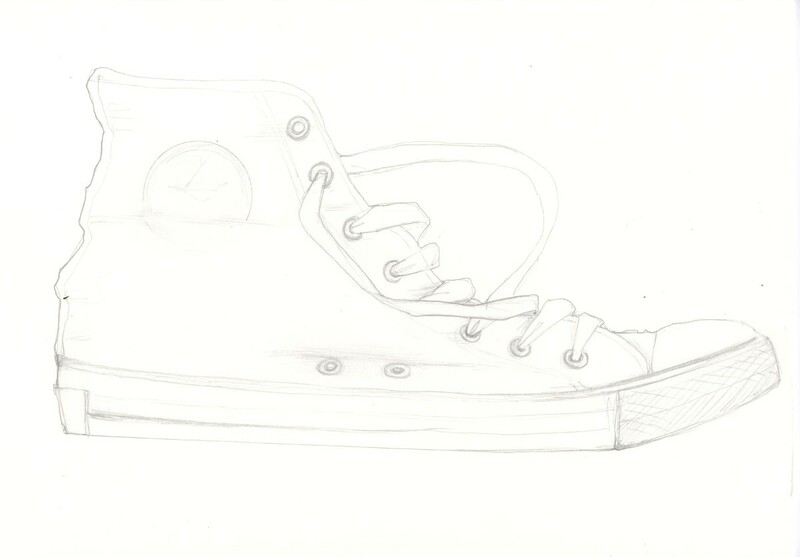 Adding the lovely details and, again, for this drawing I've added a bold outline. If you don't want a bold outline leave it out. Not every drawing needs one. Finish when you want to finish. It's your drawing. Let the drawing tell you when it's done. Well, that's the process I go through. But, hey, don't listen to me. I'm sure you have your own thing going on. Check out THIS LINK to see the other method I use for drawing shoes. Plus, you can buy my 'How To Draw...' zines, and other stuff, HERE. I think that is cunning rather than cheating! LOL. Andrea! Do you do Sock Puppets? Whatever works....and your methods work SO WELL for you! Thanks for sharing, Andrea, I admire your generosity as well as your beautiful work. Hey, if the Old Masters can use a camera obscura, then I see no shame in a bit of tracing round! If I'm doing a commissioned portrait, I will often blow a photo up to the size I want, cut out the figure and draw round the main bits to get the proportions right - it's what you do to it afterwards that mstters. I am laughing so much here! I think it is because what you write makes it sound so easy but what the pictures show is so clever! 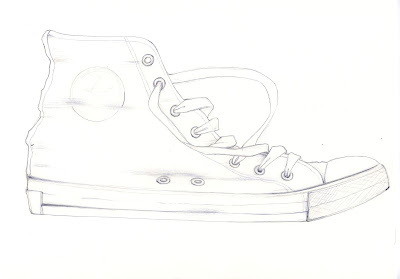 I don't think it's cheating at all... since nothing will be created if you hadn't put a shoe there and trace it to begin with. It's just a different way of producing awesome art which your friend doesn't understand. I don't think that's cheating at all!!! I would call this creative... Imaginative... Thanks for putting the steps here... I am always at awe looking at your ballpen drawings!! This is no cheating. I've taken help of graphs to get the proportions right when converting from a small one to a really large size. The actual drawing outcome is the showcase of your talent. I bet many would be able to get the proportions right by tracing or whatever, but can't produce the great final piece that you do. Thanks for being so generous, Andrea. This is Di from moreidlethoughts. I have to pretend to be anon so Blogger will let me play. Stupid Blogger! This is wonderful! Now all I need is for you to come to my house and show me why my hatching never looks like this!! In fact, I find hatching the least therapeutic part...it's where I usually blow it! "Adding Values", its a term from using drawing software like Adobe Photoshop. The "values" are the numbers to assign the shading density. 0,0,0 equals pure white. 255, 255,255 is solid black. each number represents an amount of cyan, magenta or yellow colour added. This is a wonderful post! Thank you for sharing Andrea. Well I've read your two methods and my jaw is still down to my feet! You are amazing. I think I would need you there guiding my hand to do the same thing. Then again, that's what makes us all different, doesn't it? 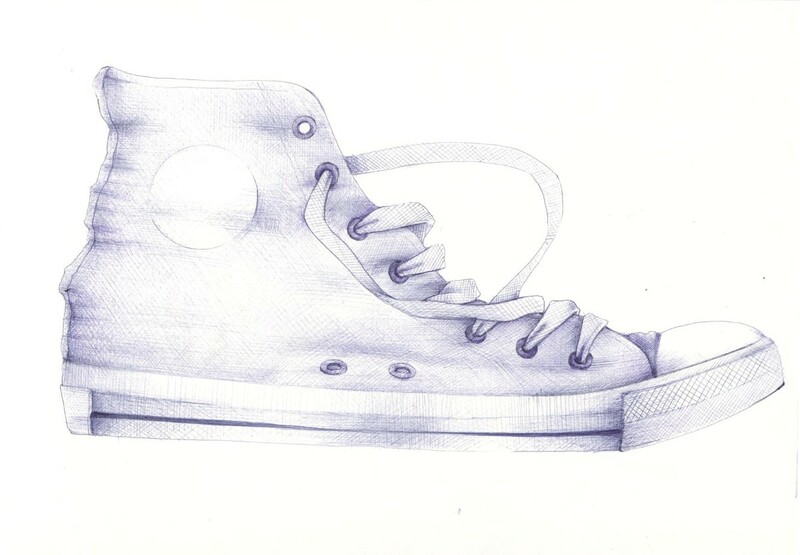 Now where are some ballpoints..oh, and a shoe. And maybe some moss.. Thank you all, so much, folks. Yes, I guess the method is the same it's just that the way of getting the outline is different. Sorry, if this is a bit of a rubbish reply but I have an 8 year old talking in my ear. I love you art very much and it is great to see how it's made! Thank you for for sharing! It is not fair! I want one. Boo Hoo! Here I could not leave the guys out. This is Kev Moore. A great musician. Here he shows off His Blue Converse Bag. I have the email from Converse. Sorry, Sherrie These bags were made exclusively for the European Market! Sherrie Roberts All Purple in the Face Now!!! What a great method! I would never have thought of putting my shoe directly on the paper to draw the outline. Could you devote a future blog posting to hatching? Do you do separate strokes or back and forth? Do you do the hatching quickly or carefully place each stroke in exactly the right place? How do you keep the lighter areas light? Awesome tutorial! You can certainly start the Andrea Joseph School of Sketching and Fine Art and then you will be the instructor and it will be all of us who don't know how to achieve these amazing effects!! I love love love these two how-to posts. I've always wanted to know your process. Excellent. I always feel apprehensive that others won't like my work, so I have it hidden and stashed away. Your sketches are very unique and cool. Wonderful talent you have here. Very nice blog. It is my first time that I visit you and I´m surprised. u r amazing. m an illustrator..a fashion illustrator but i lyk the way u have worked. gud job!! Do you use a ruler to make the cross-hatching and hatching or are they free hand?